This article was originally published in Socialist Studies: The Journal of the Society for Socialist Studies. This is the second half of the article; the first half was published here on 8/22/2014. Looking back, we can see how the fate of socialist-feminism is closely tied to the fate of the broader institutions of working-class struggle. Socialist-feminists have always engaged in a two-sided effort: to bring an anti-racist, class-based feminist perspective into social movements and left political parties and a socialist perspective into feminist politics and women’s movements. Social-welfare feminism, social-democratic feminism, revolutionary socialist feminism, revolutionary women of color feminism, indigenous feminism, are some of the different currents within socialist-feminist politics. 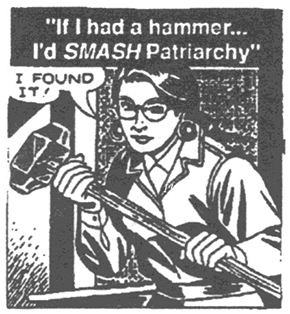 We can think of socialist feminism very broadly– to include all feminists (whether they would identify with the label or not) who see class as central but would not reduce relations of power and privilege organized around particular identities (e.g., gender, sexuality, race/ethnicity, nationality) to class oppression. Revolutionary socialist feminism is distinguished from social welfare or social-democratic feminism in that, whether implicitly or explicitly, revolutionary socialist feminists are unwilling to allow capitalism to set the horizon for what can be envisioned or struggled for. Socialist-feminists start where most feminists begin: that the emancipation of women must come from women ourselves, but cannot be achieved by ourselves. From this starting point, socialist-feminists are especially interested in building inclusive movements organized by and for working class, indigenous, and rural women. Women’s self-organization can be parochial or coalitional ― that is, it can either reproduce existing social divisions among women or reach beyond them. The political imaginary through which socialist-feminists organize aims to develop activism and leadership, education and awareness, demands and discourses, and an everyday politics that recognizes and works to overcome these deep divisions. In this process, like the women of the NWRO, socialist feminists look to developing a “both/and” politics that bridges what might be won in the here and now to a longer term project of social transformation. In the 21st century, women have entered the global political stage in an astonishing array of movements. Sparked by the capitalist war on the working class, the enclosures sweeping peasants and farmers off the land or devastating their livelihoods upon it, and the consequent crisis and intensification in patriarchal relations, these movements are creatively developing socialist feminist politics. And this politics has much to offer the left as it gropes toward new organizational forms and organizing strategies. The 21st century has seen an expansion and deepening of transnational feminist networks. There are, of course, class tensions within these networks and some networks deal with these tensions better than others.1 Still, the networks are crucial resources for socialist-feminist organizing, for it is through them that feminist discourses circulate globally, are incorporated locally and often creatively re-shaped in the process. In the global south, as women find themselves displaced, employed in precarious work, heading households, struggling to survive in informal settlements and urban slums, they are not only crucial participants in movements for 21st c. socialism, they are also building grass-roots organizing projects that challenge patriarchal forms of organizing, leadership, and movement demands. In the global north, these grass-roots projects have engaged new modes of worker organizing (such as the Domestic Workers movement) that rely on mobilizing members and building community alliances. While never perfect, of course, these different socialist-feminist projects, in north and south, in community and workplace, at their best offer new discourses of gender equality, new modes of organizing, and visions of participatory democracy. Beyond these moments of upsurge, women of the working classes have been carrying forward grass-roots projects that incorporate and draw from the participatory democratic ethos that will be central to reconfiguring the left. Women of the working classes are easily shut out of formal, hierarchical, bureaucratic organizations and, because they are so central to local movements, they have had the most to gain from new forms of citizenship that encourage and support political participation from the ground up.2 Their organizing projects aim to build alternatives to “masculinist” and hierarchical styles of work which are barriers to women’s self-development and leadership. Yet, they are also intent on organizing in communities and workplaces to win reforms, including reforms in law and government policies. Thus, activists are forced to think through how to meld the “horizontalism” inspired by the Zapatistas and other autonomous left currents with activist engagement with the state. Formed in 1989 during the NAFTA debates, CJM is a multi-sectoral, international coalition that supports Mexican factory workers. CJM’s coordinator, Marta Ojeda, began as a maquiladora worker, became an organizer, and eventually helped to found CJM. Building Self Organization: CJM teaches workers to do their own research on the companies, mapping the process of production, identifying the costs of inputs, comparing that to the prices of the products sold, identifying health and safety conditions that violate international labor law. Working together builds trust and cohesion. Additionally, by developing workers’ knowledge and analytic skills, CJM undermines the mystique of expertise that is so crucial to managerial authority and encourages confidence in a democratic socialist vision of society. Bridging Racial/Ethnic Divides: One of CJM’s areas of organizing on northern Mexico’s border is Nuevo Laredo, Tamaulipas, a hub for maquiladoras. Between 2001 and 2007, CJM organized several meetings that brought together maquiladora workers and campesinos and indigenous community members from Chiapas. In addition to creating a space for thinking critically about gender relations, these meetings bridged historic racial divisions between the indigenous people from Mexico’s south and maquiladora workers in the north. They enabled communities to learn from each other’s long history of organizing. Connecting Workplace and Community: In 2004, workers and their families sought to settle on formerly ejido land where they could live without paying rent and grow some of their own food. After invading the land, residents were evicted by order of the mayor of Nuevo Laredo; but they returned again in 2005 to claim their land. Women took the lead in organizing against the eviction and in returning to establish their community. Originally the colonia residents organized for recognition and services from the city government, but after enduring several years of the government’s violence and neglect, and following several exchanges with activists from the Zapatista communities in Chiapas, they decided to channel their energies into sustaining themselves. Women continue to play leadership roles there and residents are pursuing sustainable economic projects such as taking over a nearby water source and installing faucets on several streets, building a small clinic, solar ovens, and a wind generator, and establishing community gardens of fruit trees, vegetables, and medicinal herbs. The women organizers involved in the CJM Empowerment Program make connections among all forms of violence. They learn that the root of the problem is not just a patriarchal system but also a capitalist system that behind the scenes generates violence against women, including the latest violence perpetrated by organized crime, which is also a consequence of the neoliberal capitalist regime. Women of the colonia Blanca Navidad in Nuevo Laredo, women from the maquilas, indigenous women and campesinas from Chiapas who have been involved in the encuentros relate violence to the lack of land rights, lack of access to decent housing and jobs, to health care, and education. Violence Against Women has also been taken up by rural women organizers in La Via Campesina, an international coalition of peasants, farmers, farm workers and indigenous agrarian communities from a wide diversity of locations and cultures. Women activists in Via have been organizing to reshape gender relations within their organizations and in their communities. At its founding, in 1992, Via reflected the patriarchal norms and political outlook of its member organizations ― for example, all of the regional coordinators elected at the first international conference were men.4 The formation of a Women’s Commission in 1996 created the space for women within Via Campesina to organize to challenge patriarchal practices and policies. 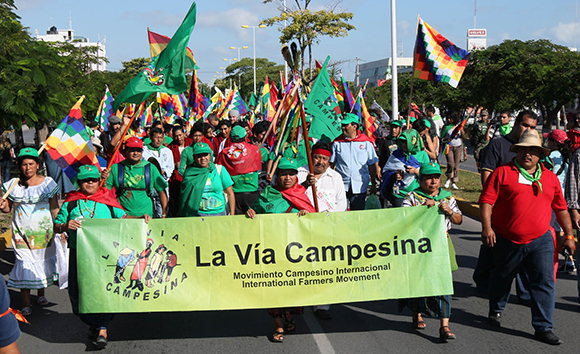 Although special organizational bodies for dealing with women’s issues can be instruments for cooptation and marginalization, this has not been the case in Via Campesina. Annette Demarais argues that this is partly because of the (relatively) democratic functioning of the Via. We demand respect for all women’ rights. In rejecting capitalism, patriarchy, zenophobia, homophobia and discrimination based on race and ethnicity, we reaffirm our commitment to the total equality of women and men. This demands the end to all forms of violence against women, domestic, social and institutional in both rural and urban areas. Our Campaign against Violence towards Women is at the heart of our struggles. This is especially interesting because sexual self-determination and abortion rights have often been “off the table” in movements engaging women of the working-classes and, more generally, there have been significant tensions (which map onto differences of race/nationality/ethnicity and class) between activists organizing around women’s practical gender interests (based in women’s caring roles in family and community) and activists organizing around demands that emerge from women’s strategic gender interests (based in women’s search for bodily and sexual self-determination).7 In the 21st century, socialist-feminist ideas have gained much greater purchase as women in popular movements, whether urban or rural, have self-organized to challenge patriarchal norms. It seems that in the Via Campesina, the tension between practical gender interests and strategic gender interests has been overcome, at least in part, through the organization of women within Via and their productive collaboration with the World March of Women and other socialist-feminist transnational organizations. Via’s recognition of homophobia reflects the global mainstreaming of LGBT rights which has proceeded with an almost unprecedented rapidity over the last few years. Yet, it is important to note that, in contrast to the liberal politics of marriage rights now sweeping the US, in Via Campesina, the struggle against homophobia is inserted into an inclusive collective vision of transformation that is also anti-racist and anti-capitalist. Turning now to the global north, I want to bring into focus the politics of caring labor and how a socialist-feminist perspective might contribute to organizing against austerity. Although the strength and reach of public services varies widely across countries, everywhere the trend is toward the privatization and informalization of caring for young children, the elderly, the disabled and the ill. This is the prominent face of neo-liberal structural adjustment in the global north. 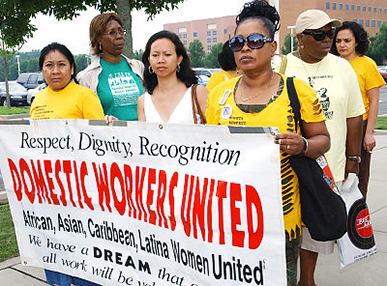 It has created a demand for immigrant labor and is responsible for shifting the gender of migrants from the south to the north from predominantly male to predominantly female.8 Women workers in the care sector span a wide range in terms of class ― from trained early education teachers and managers of day care centers to the childcare workers, teachers’ aides, house cleaners, nannies, home care workers, nursing home attendants, and others whose skills are unrecognized and low-paid. Differences of citizenship status and racial/ethnic identity are mapped onto class differences here as well. If we expand our view of caring labor to include hospitals and public schools, we see that women workers and their unions are increasingly under the sign of the “welfare queen”–entitled drains on the budget and lazy as well–in other words, barriers to improving public services. One of the most compelling neo-liberal political discourses is the demand that government be made more accountable by contracting out government services to private and non-profit organizations that are supposedly more flexible and responsive to those who depend on them. We can effectively counter this neo-liberal agenda by building on the experiments in democratizing government that have been won through popular and trade union struggles. These creative initiatives offer alternatives to bureaucracy far more compelling than the phony involvement and superficial accountability promised by privatization. Women are much more present than men as paid care workers and as recipients of caring services (often on behalf of children and adult kin); a movement to democratize care will be a women’s movement. As ever, there will be class tensions and differences especially of race/ethnicity and citizenship to be addressed. Nonetheless, democratizing care is a fruitful avenue for developing socialist-feminist politics and expanding how the left understands the fight against austerity. Attempts to democratize the state through new institutions of participatory democracy have been at the heart of the movement toward 21st c. socialism in Latin America. In the global north, experiments to “open-up” government have been much less spectacular but are nonetheless inspiring. They are far from perfect and there is still much to learn. Still, programs to democratize the state creatively break from the modes of organizing and thinking about government that have dominated union and left strategies, leaving us stuck in a dead-end debate about whether or not to work to reform the state or create autonomous pre-figurative alternatives to the state. In Reclaim the State, Hilary Wainwright describes the successes and failures of several attempts to democratize government. One, in particular, in Newcastle England, interests me, because it is about a public sector union competing with a private contractor when the local council decided to “outsource” an entire department. The union proposed a complete reorganization of the department including breaking the bureaucratic hierarchy, engaging workers in every key decision about processes and policies, sharing knowledge and expertise among workers, and providing retraining for individuals whose skills were made redundant. This was not the “teaming” so beloved by corporate managers but a real democratization through which the department operated more like a worker cooperative than a traditional government bureau. And rather than going around the union, the reorganization brought a level of union involvement at the worksite that previously had not existed. Social cooperatives, combining worker ownership with a mandate to include users of services in decision-making, create social relationships that have the potential to constitute publicly funded care services that are more like a “commons” than like consumer goods. On the other hand, they may also be used to facilitate a neoliberal agenda that undercuts public workers and their unions. A social movement unionism strategy that allies service users and public workers could contend for shared governance of schools, childcare-centers, home-care programs and many other institutions that are at the core of socializing the labor of care. Socialist-feminist politics offers a unique strategic perspective for organizing in the 21st century. Socialist-feminists’ commitment to self-organization supports organizational structures that are non-hierarchical and democratic and therefore more inclusive.10 Attention to intersectionality as a guide to both program and political discourse ― the demands that movements make and the language we use to support those demands ― opens a ground on which deep social divisions might be overcome rather than reproduced. Understanding the ways that workplaces, households, and communities are inter-related leads to more effective modes of organizing and more possibilities for coalition politics, making connections between what are often seen as very different and separate issues/struggles. Socialist-feminist visions of leadership and of leadership development promote activists’ capacities for engagement in democratic decision-making and collectivity. The recognition that affect, emotions, sexuality are always present, shaping social relations, encourages activists’ self-reflection, empathy, and respect for different ways of being in the world. In the 21st century, as women of the working classes enter onto the political stage, they are creatively renewing socialist-feminist politics. If we are to build 21st c. socialism, then it is time to pay attention to 21st c. socialist-feminism, moving its theory and practice from the margins to the center of the revolutionary left. Johanna Brenner is a community activist in Portland, OR and an advisory editor of Against the Current. She is Professor Emeritus at Portland State University. See Sonia E. Alvarez, “Translating the Global: Effects of Transnational Organizing on Local Feminist Discourses and Practices in Latin America,” and Valentine Moghadam,Globalizing Women: Transnational Feminist Networks. See Janice Haaken, Hard Knocks, Domestic Violence and the Psychology of Storytelling. Alexandra Bradbury, et. al., How to Jump-Start Your Union: Lessons from the Chicago Teachers.